From correctly reporting unclaimed property to each state, to protecting customers and shareholders, Keane is the only company to offer a comprehensive suite of communication, consulting, and compliance services. With more than 60 years of unclaimed property experience and expertise, Keane is uniquely positioned to help clients reduce potential unclaimed property exposures, ensure compliance with state regulations, and support operational performance without compromise. Keane provides more than 5000 corporations, mutual funds, banks, brokerages, insurance companies, and transfer agents with an unmatched depth and breadth of unclaimed property services including customized communications programs, customer data analysis, in-depth consulting, and annual unclaimed property reporting. Keane’s customized outreach and communication programs deliver clear, measurable results. These programs help protect shareholders and consumers, reduce risk, and increase customer satisfaction. Keane possesses the knowledge and expertise needed to assist companies as they navigate the complexities of unclaimed property reporting while complying with continually evolving state regulations. As states continue to target unclaimed property, it’s more important than ever to ensure full compliance when reporting unclaimed property, establish effective internal controls and processes to minimize and avoid costly audits. Keane’s Consulting and Advisory team can also guide you through the audit process if you’re already facing one. Our comprehensive suite of unclaimed property services strengthens clients’ compliance efforts, reduces costs, protects shareholders, and retains customers. We have helped privately-held companies, Fortune 1000 corporations, and financial services firms improve their risk profile by evaluating their abandoned property compliance levels, implementing internal controls, and establishing programs for reporting unclaimed property. We also work to identify accounting errors, exemptions, and property that may have been incorrectly identified as reportable – all of which can significantly reduce your unclaimed property reporting obligations and help avoid overpayment. Backed by a team of unclaimed property experts, former state administrators, and account recovery specialists, there isn’t a challenge we can’t overcome. Whether we handle your unclaimed property reporting and compliance needs, protect your shareholders, or mitigate your audit risk, we are the unclaimed property team you need to get the job done right.  Fill out this form & a Keane representative will contact you with an unclaimed property reporting assessment.